Okay here is another poll that is of interest to me. My 05 Jeep Liberty is on the fritz and am considering buying a new car so I need to know what toad you guys use? Suzuki Vitara - 4 down. 2003 Jeep Wrangler, 4 down. 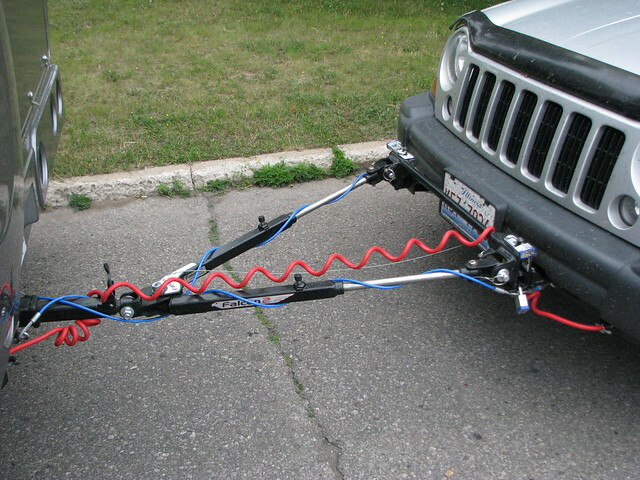 2006 Jeep Liberty 4-down with Roadmaster tow bar and Unified tow brake. I have only tow once with the PC. I towed my wifes 2004 Jeep Liberty using the old set up from the previous motorhome. Big and very heavy Blue Ox tow bar, no supplemental brakes. I did get push a little when stopping. We pull a Chevy HHR automatic four down with a Blue Ox towbar and an older Blue Ox braking system when I'm in states that require it or anywhere it's hilly. Crossed the Rockies several times last year with no problems at all. Only limitation is that Chevy says no towing over 65 mph, but I don't like to go any faster than that anyway. By the way, I bought one of the switches to put in your fuse box so that you have only to bend over and flip it to rig for towing without running down your battery. We tow a 2004 Chevy Cavalier (2500# automatic) 4 down. The tow bar is a Blue Ox Aladdin with Break Buddy as the supplemental breaking system. The Aladdin is aluminum and weighs 36 pounds. Same speed limitation of 65 MPH but do not need to pull any fuses. I was surprised at how many newer cars equipped with automatics can be towed 4 down now. Here is a link to the Motor Home Magazine towing guide. A lot of good information but there is more than a little advertizing. Remco website is also a good source of information. They will tell you what needs to be done to your car to make it towable. 07 Honda CR-V, 4 down. It does need to be run thru all the gears, no fuse to pull. I did wire a hot lead to the battery. 2007 Ford Edge (4600#), Blue Ox Aventa bar and Roadmaster Even Brake. Auxilliary lighting system functions from PC and hot lead to Toad-Charge. Tows fine but is a load on that little V10 (formerly on an Alpine Coach with 8.3 Cummins ISC). I currently tow my 05 Jeep liberty 4 down with a demco system. It is a diesel with lots of miles and is starting to give me headaches. My wife has a mini cooper and I am thinking about towing that, but I am not sure the first lady is happy with that thought. I might consider another Jeep, but quality remains an issue with Jeeps. I am with you on that one. Our 2006 Jeep Liberty gaser does not impress me at all regarding quality and all the rest. My wife likes it a lot because it's cute to her. It's her daily driver, and so that is why we have it. I do like towing a 4x4 very much, but would not consider anything Chrylser again. I'd look closer at the Ford and GM lineup, and anything else that is not a Chrysler. Sorry if I insulted any Chrysler owners here. Our Liberty is a gaser and doesn't require money......yet. It's just awefully irritating to drive. The active handling/traction control is near dangerous. When you need to get going fast, the engine likes to slow down so you don't lose control. It over reacts way too much from the throttle action of the driver . One other irritation which is now an industry trend, is the lack of a passenger side & rear door key hole. When on vacation, we don't carry the huge bulky key with integrated keyless entry, to reduce bulk in our pockets. We also don't want to submerge it when swimming or when caught in the rain. We are camping outside afterall with an outdoor fun-mobile, right? Who would take away all but one key hole on an outdoor fun-mobile? I don't carry that bulky key in every day life either because I drive another vehicle daily. It's my wife's Jeep of which I drive only when we are together. With that said, I can't open the door for my wife in everyday life. I always have to open the driver door, then hit the unlock button for her. Those goof ball bean counters in the auto industry really need to think smarter. They save $10 in the cost of parts and labor but torture the people that bought the vehicle. Shopping for the next 4x4 with key holes for every door, will be a very high priority.